The launch is on Wednesday 30 March 2011 at Glasgow University's Charles Wilson Building. 11.00 Personal Testimony – Maxwell T.
(A) A culture of disbelief? 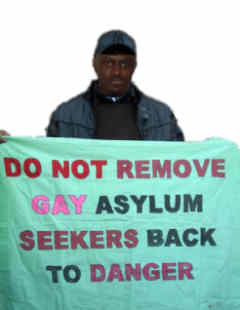 Many LGBT asylum seekers’ claims are refused as the UKBA do not believe that they are gay. How can we best support people in this situation? Is there a wider culture of disbelief within the asylum process and, if so how can we best raise awareness of problems faced by LGBT asylum seekers and refugees? LGBT asylum seekers in Scotland are often very socially isolated. Due to fears about being open about their sexual orientation or gender identity it can be very difficult to access support. How can we best break down these barriers and ensure all services and community groups are inclusive and welcoming? How does the asylum support system impact on LGBT asylum seekers? Does living in poverty and coming under pressure to ‘prove you are gay’ place asylum seekers at risk of sexual exploitation? Is there more we could be doing to campaign for a fairer system of support?